Funeral for Self-Esteem | Indestructible Ideas! It pains me to see lypo vacuums, silicone bullets, and mascara tears. With the amniotic fluid tsunami, comes out societal fears. Celebrity magazine cut outs bonded to teenage walls. To release the pain, you buy self-esteem at malls. It makes me sick to witness SICK diets. Stomach belts to ‘slim’ you down. Insecurity is the water that causes you to drown. Bras doing pushups on your chest. Little boys and girls will be impressed. No summer body, so vacant beaches. 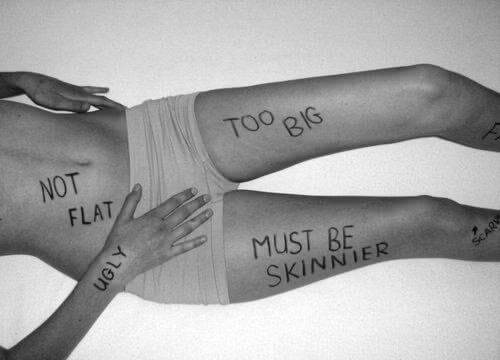 Too focused on society’s judgment. Let it go, release that weight. Are you, or are they in control of your fate? Victoria Secret makes you want to go to the gym. You want to be slim. Looking at others work out; withdrawn. 3 days of the gym and you are gone. “Fat, obese, ugly,” they scream! Verbal machetes slash self esteem. Self-worth and self-respect are constrained by mental bars. Is when boys give you sexual interaction. Clothes taken off, legs open, tension. Feel useful when your clothes lie on your floor. Once back on, boy leaves and shuts the door. Now you no longer feel worthwhile. Wondering what you got yourself into. Need the high heels and makeup to feel pretty. Wal-Mart Super Centers and outlet malls are the new holy cities. Need your nice kicks and name brand clothing to feel handsome. Yet the apparel you wear is made from people held at ransom. Fabric sprinkled with a blood, tears, and sweat. Higher wages, benefits, and regulations are a corporation’s threat. When you can’t live up to it, comes out insecure conditions. Famous people you try to follow. That their path is the right one. Naïve. Use to be real, now you’re artificial. Friends, peers, and family put you down. Worthlessness seeps into your head from that pretend crown. You work over the summer to get that incision. New breast, nose, or chin. Now, an appearance of a stud. Scars healed but you still feel inferior. Because you realize it’s phony, counterfeit, pretend. Yet, you forget you must cure yourself from within. Until then, you’ll always feel insignificant. Love yourself, ignore society,… you’re SIGNIFICANT!! Gino, the rhyming pattern is a tad too elementary, monotonous and expected – good writing is not easy, for me at least. Go deeper, spend more time on the next one – you can do better. Break from the cliché. A great poet lives in you. Thank for your constructive criticism. Can you be more specific as to what is cliché? Gino, I liked the rap format — I can almost hear it chanted through the microphone as you pace the stage! I also liked your imagery, your similes/metaphors. I’m fascinated by the different styles of writing you experiment with! And your topic is — of course — very apropos! that was some cool shiznit…..the light has to come from within……and out….I have gone through this…. So that when you come out of it…and see your true inner light, you become so awakened and never forget that feeling…???? I am really happy that you have experienced this awakening, now, if we can only guide others into awakening so they no longer suffer. I couldn’t have said it better. Thank you for reading!